Naval units, sometimes referred to as ships, are currently NPC vehicles in War Thunder, often used as objectives in Ground Strike or Operation missions, with promised development for player use later on. Defensive AA fire with timed fuzes. Landing Craft are relatively slow, very small, and have practically no armor. Their sole purpose is to land and launch tanks, armored cars, or AAA vehicles on maps such as Saipan, Top of the World, Pacific Hidden Base, Pearl Harbor, Jungle, and some other maps featuring coastlines. 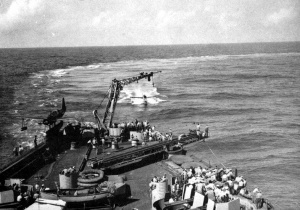 The sole advantages of a Landing Craft is that their minuscule size makes bombing difficult, and fighters that try to strafe them are often diving too quickly to have any effect. 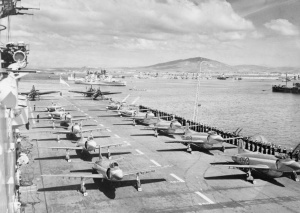 HMS Eagle flight deck with Supermarine Attackers at Gibraltar in 1953. Patrol Boats are often seen escorting Landing Craft, and, unlike their rather frail comrades, can withstand barrages of Machine Gun fire. They are most effectively dealt with by strafing with cannons, shooting them from the top, or bombing them from low altitude. Using heavy ordinance on these small craft can safely be considered a "waste," as they often are not close enough together to get multiple kills with one bomb. Destroyers are large naval vessels designed to deal with many seaborne threats as well as those of the air. Their Anti-Aircraft Artillery fire can become withering in groups, so be careful when attempting to torpedo them. Destroyers have moderate armor, and are best dealt with by bombs from low altitude or dive bombers, or occasionally torpedoes. Rockets, excluding the Tiny Tim 298 mm rocket, have difficulty destroying destroyers, and may be unpredictable when used for said purpose. A destroyer can consistently resist bombs of up to 100 pounds. Light Cruisers are also large naval vessels designed to deal with a myriad of targets. Their guns are larger and their armor is heavier than those/that (respectively) of a destroyer, and their flak output can be fierce even on their own, although, some of this hasn't been seen in-game except for a range buff to Light Cruisers. Again, they are dealt with best by bombs or torpedoes. Light Cruisers have been known to resist 100 pound bombs, and may even survive 250 pounders. Using heavy ordinance can ensure the destruction of the target, and hopefully victory for your team. Light Cruisers can be found at Tier II and up, on maps like Two Towns, Preparation for Military Operation on Hokkaido, Lonely Island, and others. Light Cruisers can also be seen in the "Jungle" map for Ground Forces, and can be destroyed with artillery (although they are mostly immune to all tank fire). Heavy Cruisers have heavier guns and armor than Light Cruisers, but tend to be much slower. Usually seen at Tier III and up, and occasionally seen at Tier II, Heavy Cruisers have huge ranges (but little accuracy at distance) with their flak batteries. Often times, Heavy Cruisers can harass bomber pilots who fly over them at high altitude. Heavy Cruisers are best dealt with by using torpedoes or bombs. Heavy ordinance may be needed to eliminate a Heavy Cruiser, however, as they can shrug off most bombs at 250 pounds or below. Be warned also that 500 pound bombs may not destroy them in one strike. Battleships are rarely ever seen at or below Tier III, and have the largest guns and the heaviest armor, but tend to have leaner AAA armaments and be very slow. Battleships are best dealt with by heavy torpedoes, because they may be able to shrug off even direct hits from the 4000 pound "Cookie" bomb that the Wellington can carry. Battleships are often escorted by Destroyers, Cruisers, Heavy Cruisers, and/or Light Cruisers, but don't seem to do much as NPC vessels, other than provoke rage from bombers trying to score kills. Battleships are practically immune to all rockets (excluding the Tiny Tim). At the time of this writing, the author had only ever seen and engaged battleships in one map, the Arcade version of Peleliu at Tier II, where he attempted and failed to destroy one several times with a 4,000lb "Cookie" Bomb, even though the bomb-following camera confirmed direct hits. NPC Aircraft Carriers function as spawn points and bases in some Naval Maps, such as Saipan and Midway, and often have the health and damage-resistance seen by Airfields on the ground. 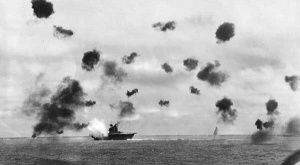 Aircraft Carriers are best dealt with by heavy bombers bombing from medium to low altitude, as attempts at torpedo attacks may provoke vicious counter-attacks by enemy fighters that are spawning-in. Cargo Ships are freighters that primarily serve as targets for torpedo bombers, dive bombers, and heavy bombers on maps such as Top of the World, Fjords, and Crater. They have some AAA, but it is often ineffective. Cargo ships are often located near the spawn points of their respective team, and some spawn in advantageous positions, such as behind a cliff in the Fjords map. Player warships have not been introduced and are currently planned as a post-release feature, according to the Q&A with Anton Yudintsev. However, players can still participate in the development of Naval Units by contributing to the Naval Forum. This page was last edited on 24 September 2018, at 07:29.